Within the next two months, CozZo will launch a highly requested feature as part of its Household Subscription Plan – a next-gen barcode scanning solution. In the meantime, we are unlocking 50 free passes for the first CozZo users who wish to join our Power User’s Club. After the pre-launch period, our club will grant you free access to our premium barcode scanning feature, with all its future upgrades and innovations. To claim your pass, please sign-up below with your Gmail address. This will allow us to unlock the feature. As soon as your free pass is ready, we will send you a confirmation email and directions on how to unlock your account. Please make sure that our email address – team@cozzo.app, is whitelisted in your Gmail. 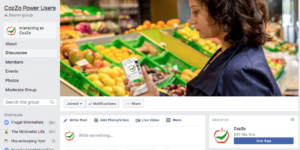 In addition, you will be invited to join our secret Power User’s Facebook Group where we share tips and insights from “the kitchen”. Your ideas, suggestions and feedback for further CozZo iteration and improvement are most welcome. We’ll love to hear back from you. Barcode can be scanned from any angle. Cozzo’s barcode scanner allows you to scan your grocery items quickly and accurately, regardless of the package surface and material, the position or direction of the barcode label on the item, or the angle of your camera. Our scanning solution overcomes the tedious frustration associated with most existing phone camera barcode scanning options. Our barcode scanning solution recognizes over 300 million product names. 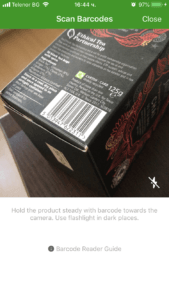 The scanned items will appear on your phone screen with their original package names, for e.g. 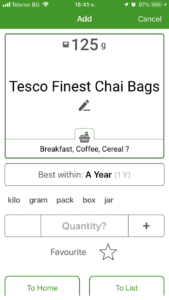 “Tesco Finest Chai Bags”. You can change all 3 names to simply “Semi-Skimmed Milk”, and for future scans, CozZo app will remember their barcodes and automatically display them as “Semi-Skimmed Milk”. If by chance an item is still missing in our database, you can quickly add it with our autocomplete dictionary. The assigned name will hence be remembered for all future references. Please keep in mind that our pre-launch system may experience a certain percentage of unsuccessful new product scans during some periods of the day. CozZo extracts the package size as separate product property. CozZo’s advanced barcode scanner also detects the specific package sizes and enters them automatically as part of the product description, for e.g. “125g” of tea. This way, you will no longer need to assign weight or volume to items that are sold in boxes, cans, packs, bottles etc. They will appear directly as part of the product card. Use the new “Scale” button to assign package size to any item, regardless if it is scanned or otherwise entered. When a quantity or measurable units is selected, e.g. 300 grams., a scale button appears above the product name. Pressing the button sets a product package size (300 grams), allowing you to plan your shopping and review the catalogue in a more convenient way. For all the products for which package size or measurable quantities has been listed, the built-in CozZo Food Pie Chart will be able to calculate and report precise used-up and uneaten percentages. So if you are an active CozZo user, here is a unique opportunity to get even more out of your food management app. Join now, to claim your free pass for CozZo next-gen barcode scanning solution.